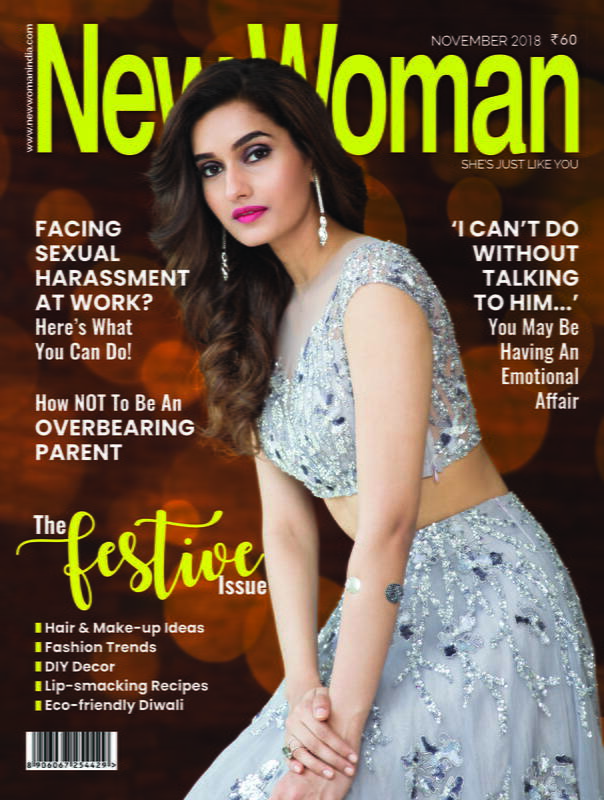 Read on to boost your knowledge of rangoli-making techniques this Diwali. Rangoli is an obvious part of every Indian traditional decoration during any religious and/or auspicious events/celebrations. And when it comes to Diwali decorations, rangoli is mandatory. Every Indian household will have at least a minimal rangoli made right outside its threshold. Here are 14 techniques of rangoli making you can opt for this Diwali. 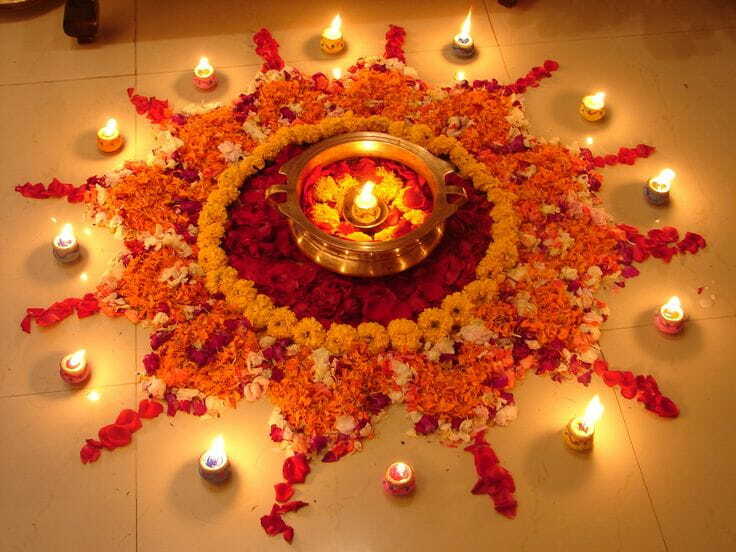 The simplest and easiest way to make an elaborate symmetrical rangoli is by putting equidistant dots on the floor. 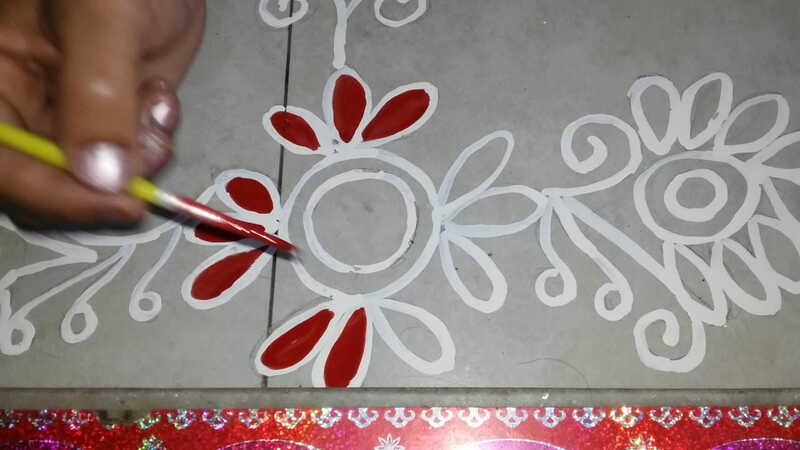 Draw the rangoli design with either trailing a wet piece of chalk or by directly pouring white rangoli powder bordering the design. 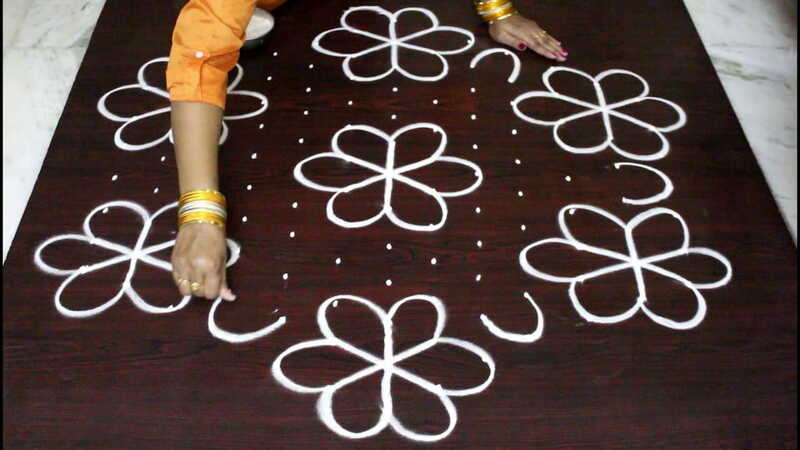 This is one of the most used techniques of rangoli in all households. Known throughout the south Indian states, rice-flour rangoli is known by many names. 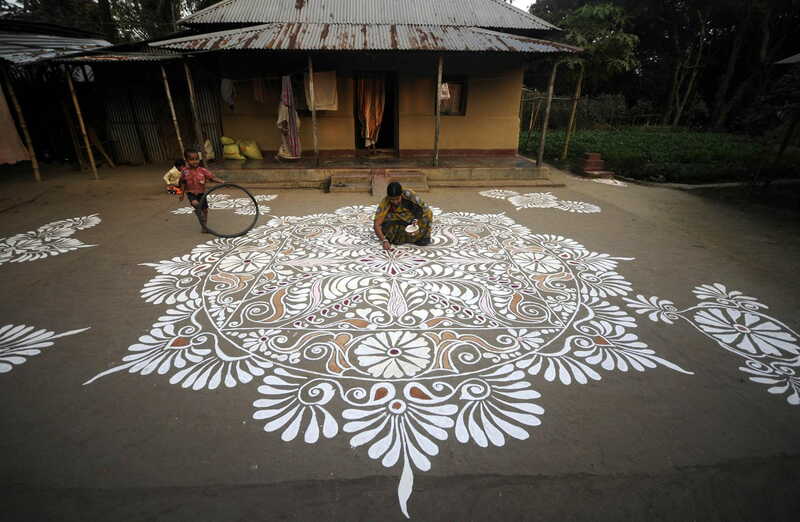 This type of rangoli technique is nearly thousands of years old and still is a living technique. To add colours, women use paste of vermilion (kumkum), turmeric, indigo, etc. They may look mostly white and simple but the more intricate designs you go for, the more efforts it takes. Many rangoli artists these days are promoting free-hand rangolis. If you are pro are understanding the rangoli powders, the pouring techniques, etc., this type of rangoli-making is probably the quickest one. But this technique is mostly used for designing animal motifs, gods and goddesses, etc. Shading too can be achieved easily is you are thorough with the art. 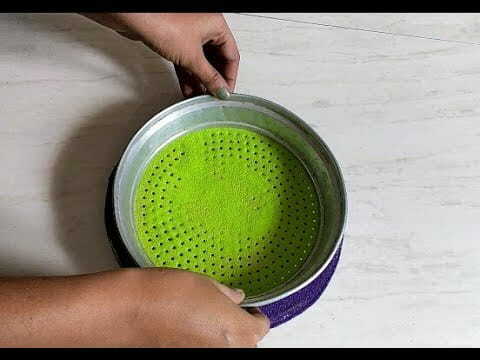 Sieving technique in rangoli-making is one of the quickest, easiest and most efficient methods of pouring colours in rangoli designs. You just need a sieve with moderate-sized holes. Floating rangolis are not at all new. They are designed on water in a wide-mouth low-height vessel. 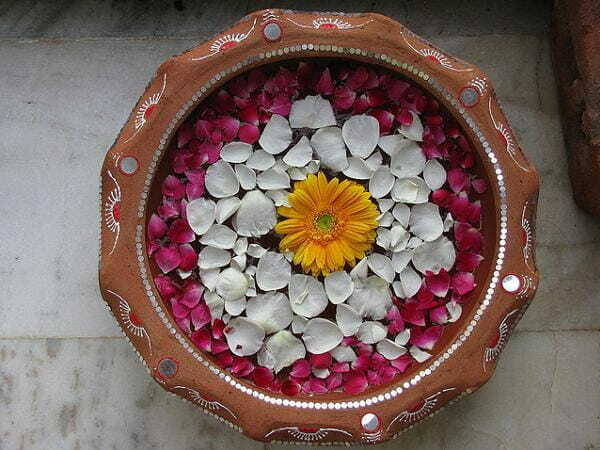 Usually, floating rangoli is made of flowers and flower petals, but nowadays we have special colour grains that do not get ‘wet’ and sink into the water. If you have a bigger sized hall and there is empty space somewhere that you want to add something to, opt for this and add colours to home space. Another rangoli technique that has been there since centuries. 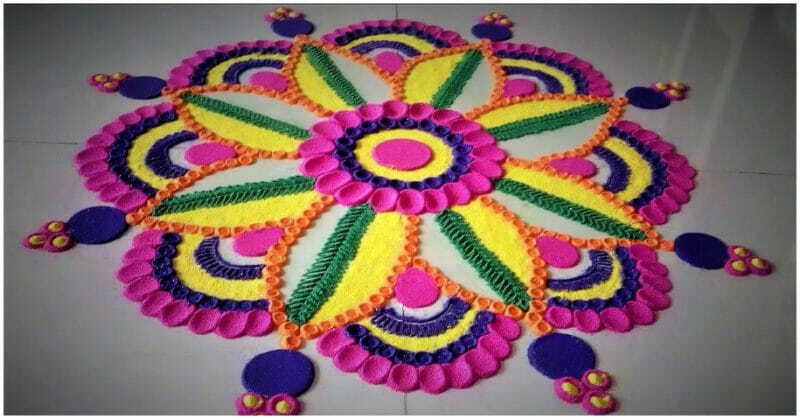 Floral rangoli is not limited to one few parts of the country. Most common flowers used are marigolds, daisies and roses. If you want to add some green in your floral rangoli, use neem leaves – this will not only serve the purpose but also will naturally purify the air. Also read: What Is The Meaning and Significance of ‘Dhanteras’ Before Diwali? 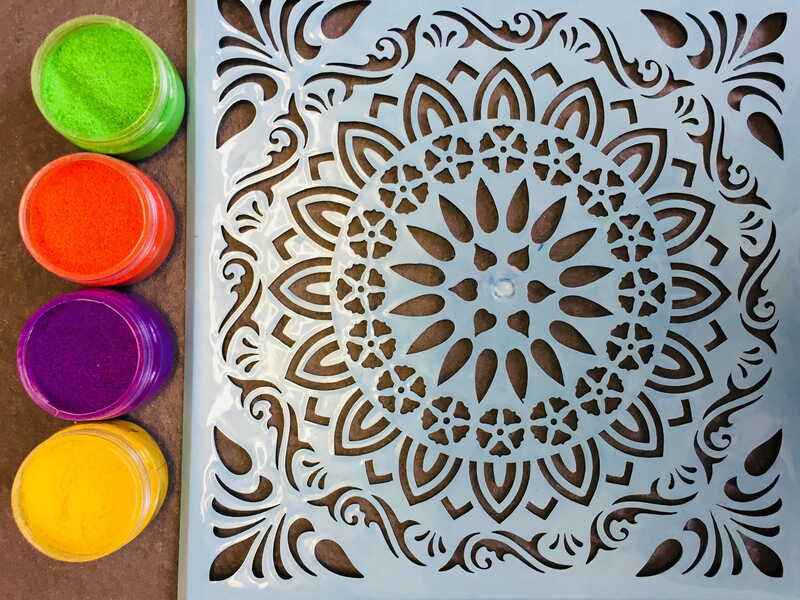 Wooden rangolis are absolutely hassle-free. These are pieces of crafted (designed and cut) wooden plates glued together or a whole wooden plate designed and carved as one whole design. The decoration of this rangoli depends on region to region. Though it was more popular among Banjaras and such nomadic tribes, today even an urban woman will want to buy these for obvious reasons. Sticker rangolis require absolutely zero-efforts. You just need to peel off the sticker and paste it properly on the floor. 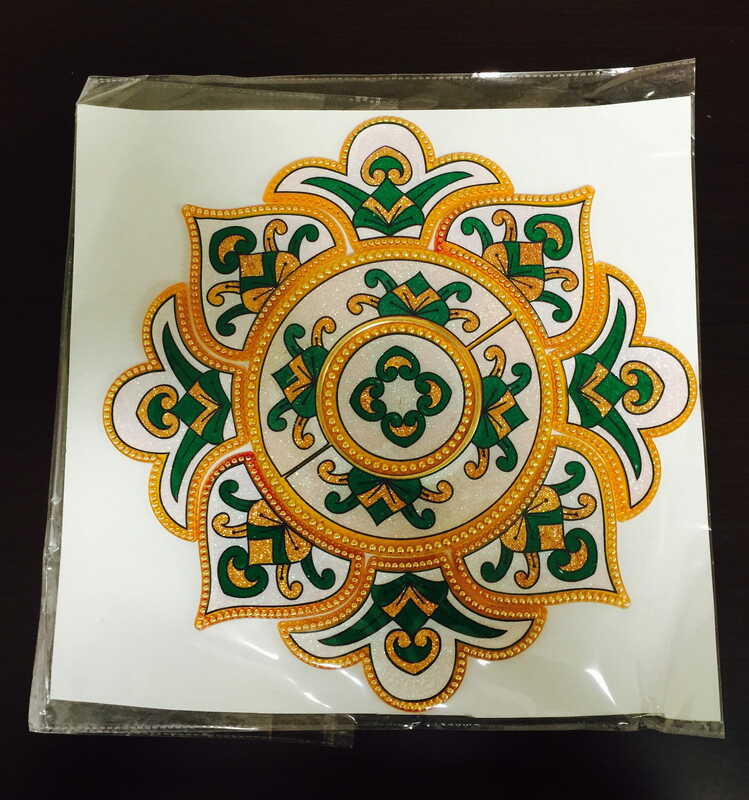 Many Indian household will have a miniature sticker of mandala rangoli design and/or of ‘divine footsteps’ on the two corners of their threshold. 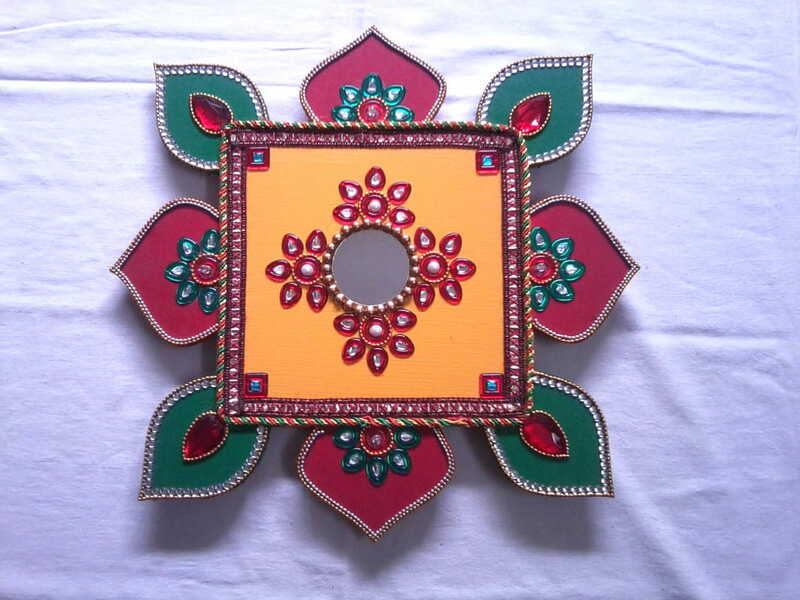 Nowadays, sticker rangoli designs also come with flattened LED lights to add extra festive bling. Many traditional urban households, who want their threshold to have rangoli 365 days of the year, use this technique of rangoli, even though this technique is absolutely modern. 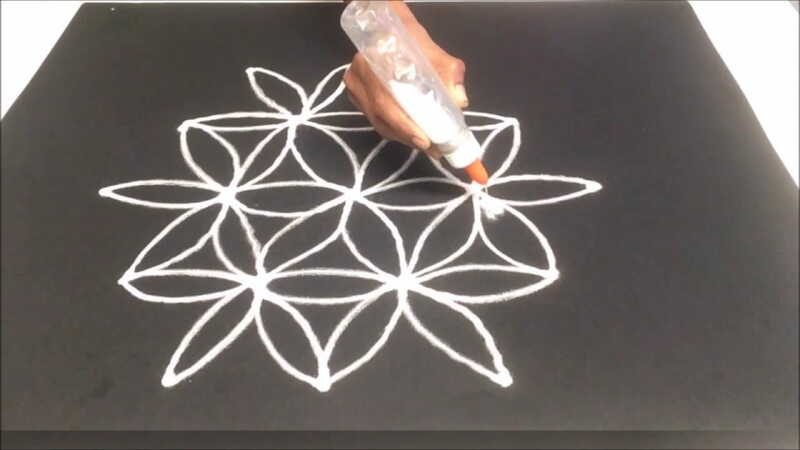 Quick-dry oil paints are used to draw rangolis. The pouring technique of rangoli is only possible if the rangoli powder is slightly coarse and sandy. Same goes with the coloured rangoli powders. There are various apparatus that can be used in this – an old bottle (make a hole in its top), a plastic cone, etc. 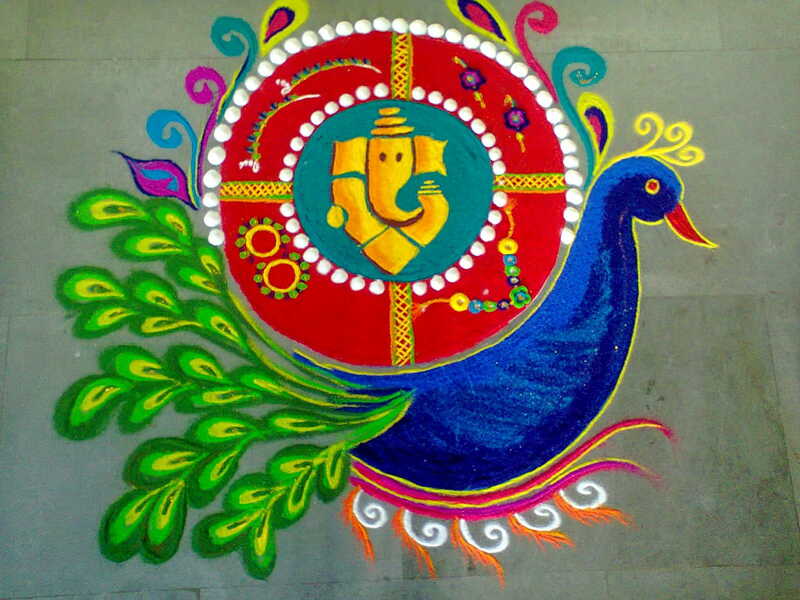 Thanks to various modern artists, rangoli moulds have made intricate rangoli-making absolutely jiffy. There are n-numbers of such mould/design sheets available in local markets to opt from. 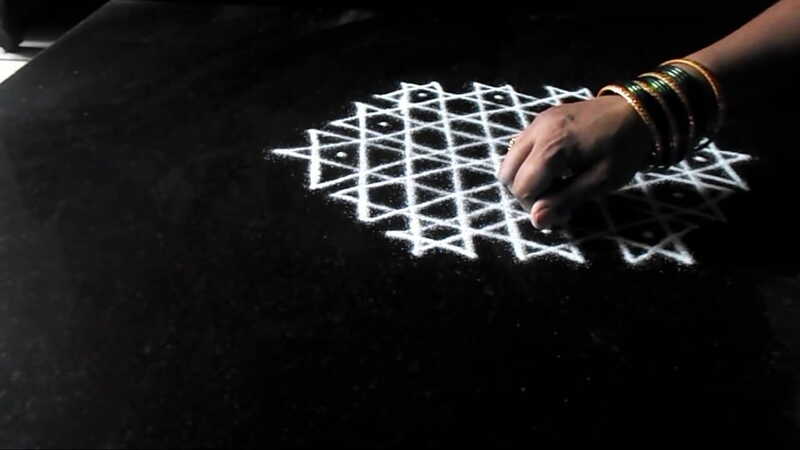 The most traditional technique of ‘putting’ rangoli powder is pinching the powder in between index finger and thumb and releasing it in line. This technique is relatively slower but the results are superb!